Surprise-releasing their sixth full-length on Bandcamp on 21st December wasn’t exactly the brightest move for Krallice if they were aiming for maximum publicity – it’s far too close to Christmas for most of us, and catching up in the new year when there is a whole new crop of releases to discover is unlikely. I made time for Prelapsarian, however, and I’m glad I did even this late, as it’s possibly the band’s best release to date. 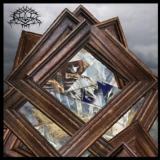 As dense and technical as ever, but with better songwriting and steps taken out of their comfort zone, Prelapsarian shows Krallice’s skills off particularly well. For the first time ever, the band seem less like aliens transmitting their cold, otherworldly racket into your head, and more like a band, making music as out-there as it is. Krallice seem to be perpetually reinventing themselves as they approach their tenth year of existence, and the music here follows suit, absorbing the tech-death meanderings of Ygg Huur and turning more towards prog in the traditional sense rather than the constant blizzard of riffs of before. It’s still dense and abstract, but you’re given time to enjoy the riffs and playing here – good god almighty, have Krallice discovered dynamics?! Well, to some extent. Opener Transformation Chronicles is the most traditional Krallice track present, a speedy blur of riffs and blasts that attacks without mercy, opening up around the six-minute mark into widdly lead guitar. Immediately after that, however, it breaks into ambience, the guitars playing slow, feedback-heavy notes, and even when joined by drums it still feels like a huge change in style, the subsequent build back into the usual blizzard working better as a result. Hate Power is the track that will be talked about most, a short blaster that is the closest the band have come to tech-death yet – almost like Suffocation at double speed. My favourite track here, however, is the closing Lotus Throne, which opens with the usual dissonant whir but which allows the riffs more breathing room, and does most to earn the band’s avant-garde tag with some of the later sections of guitar interplay. Of course, it’s still Krallice to the core, which is either a good or bad thing depending on your view of them, but I’m pleased that they’re continuing to tinker with their sound without compromising on what makes them unique. You can hear and buy the album at the bandcamp link above.